The greatest single factor that shaped the contours of African American socioeconomic and political experiences in the twentieth century was the Great Migration. The cotton market collapsed in 1914-15, as U.S. merchants were unable to export goods to Europe during World War I. Thousands of farmers, black and white, went out of business. At the same time, the infestation of the boll weevil destroyed millions of acres of cotton across the Black Belt, reducing production. The mechanization of southern agriculture also reduced the demand for unskilled black labor. All of these economic developments, combined with the daily insults and oppressive conditions on public life imposed by Jim Crow segregation, prompted growing numbers of African Americans to leave their homes and seek to establish their families and communities elsewhere. With the rapid growth of northern manufacturing and industrial production, blacks understood that new employment opportunities and a higher standard of living would be available to them outside the South. 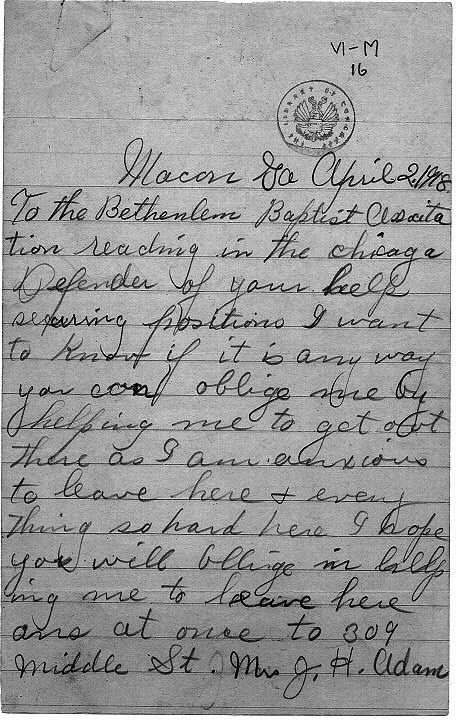 Source: Carter G. Woodson Papers, Manuscripts Division, Library of Congress, Washington, D.C.
As early as 1917, W.E.B. Du Bois observed that at least one quarter of a million African Americans had migrated to the North since 1910: “here we see a social evolution working itself out before our eyes. The mass of the freedmen are changing rapidly the economic basis of their social development.” What historians later would term the Great Migration occurred first between 1915 and 1930, represented by two great streams of black population. The first stream came from the southeastern states, Georgia, the Carolinas, and Virginia, resettling in the major northeastern U.S. cities – New York, Philadelphia, Washington, D.C. Baltimore, and Boston. A second migration came from the central Black Belt regions of Alabama, Mississippi, Louisiana, and Arkansas, moving northward into new black urban neighborhoods in Chicago, St. Louis, Detroit, and Cleveland. The racial demographics of urban America were fundamentally altered. By 1930, over 150,000 African Americans were living in New York City. Nearly two million blacks had migrated to urban centers before the Great Depression. The migration slowed during the 1930s, dropping to three-quarters of a million people. But the migration resumed, with a second wave of over 1.5 million black migrants in the 1940s, and another two million during the 1950s. By 1940, 22 percent of all blacks in America lived in the North, compared to a mere 10 percent in 1910. This major demographic shift produced dramatic changes in the labor patterns of blacks. In 1890, 63 percent of all black males were agricultural workers, 22 percent were domestic servants and only 14 percent worked in transportation, communications and/or manufacturing. In 1930, the percentage of black male agricultural workers declined to 42 percent. Only 11 percent were domestics, but 36 percent were employed in manufacturing, transportation, and communications. The number of black-owned businesses skyrocketed from 20,000 in 1904 to well over 70,000 in 1929. Furthermore, many more black youth were enrolled in schools, and by 1955, black illiteracy was only at 15 percent as compared to 61 percent in 1890. The migration from the rural South to the urban Northeast and Midwest, and the growth of a black urban working class throughout the nation, brought an improvement in health care, education, and economic and political life for millions of black people. Nevertheless, the substantial gap between the socio-economic and political status of whites and blacks still existed and was reinforced across the nation by the rule of Jim Crow. Urban communities defined by African American cultural, economic, and social life became part of the nation’s major cities: Harlem and Bedford Stuyvesant in New York City; Chicago’s South Side, Cleveland’s Hough district, North Philadelphia, and Los Angeles’ Watts district. African Americans once again encountered fierce discrimination in these cities. White banks carried out informal policies of “redlining,” limiting the access of blacks to credit and capital. Real estate firms refused to sell homes to blacks in predominantly white districts, and charged outrageously high rates for apartment rentals even in poor neighborhoods. Blacks were frequently not admitted to white hotels and were sometimes relegated to Jim Crow sections at restaurants and theaters. Black city residents realized quickly that moving North did not mean escaping the terrors of Jim Crow. W.E.B. Du Bois, excerpt from "The Migration of Negroes". W.E.B. Du Bois, "The Migration of Negroes," Crisis (June 1917): 63-66. At the outbreak of World War I, industries in the north open employment to African Americans. They leave the south in record numbers for jobs in the north. Source: NBC News/iCue.